Even though you may not be able to take your friends with you on your trip to the City of Lights, you can bring memories back home with these thoughtful gifts. A visit to Paris is not complete without a visit to Angelina. This historic, luxurious tearoom is a mainstay of the sophisticated Parisian experience (think Coco Chanel’s go-to brunch spot). 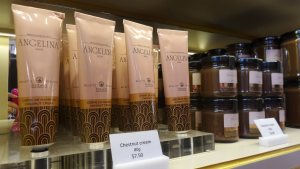 One of the famous delights of Angelina is their iconic chestnut cream, which is used in their signature dessert, the Mont-Blanc. Various sizes are available in tubes and jars, and friends will welcome a little taste of French elegance on their morning croissant. 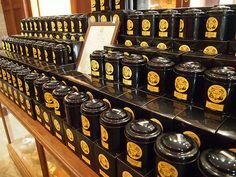 Tea lover or not, Mariage Frères gourmet blends of fragrant teas make for an excellent gift. Their complex yet delicate selections are beautiful in both presentation and flavour, immediately evoking thoughts of refined Parisian culture. Let your nose guide you around the charming museum-like boutique in Le Marais, with floor to ceiling displays of of Earl Greys and Jasmine blends. The incredible Jacques Genin creates some of the most revered confections in Paris. His caramels and pâtes de fruits make for great gifts, as their jewel-like look and pure taste will make any gourmand weak in the knees. 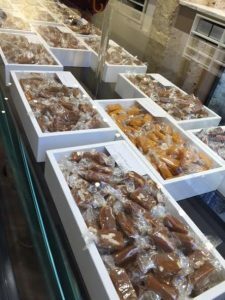 The JG boutique in Saint Germain offers a picturesque selection of caramel flavours including pistachio, vanilla, macadamia and their out-of-this-world mango passion fruit. 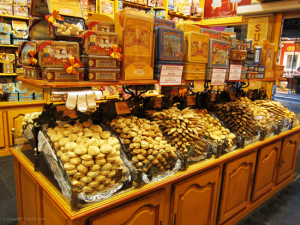 Making a visit to Le Cure Gourmande in Paris is an experience in and of itself. Adorably outfitted staff welcome guests will selections from their trademark tins to be nibbled upon as they stroll through the shop. While the Madeleines, nougats and lollipops are certainly eye-catching, grabbing a box of the sweet biscuits will really represent the famed French confectionery, as the iconic tins add a little French countryside to snack time. With the acclaimed Meilleur Ouvrier to France designation, the Maison George Larnicol spot in Le Marais is always bustling. So collecting a package of some of their amazing chocolates and candies will really show you care. 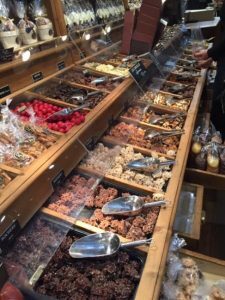 Scoop up some almond clusters (dark, milk or white chocolate varieties), truffles or brittles into an artful ribbon-tied bag and show someone you really know their their specific sweet weaknesses. 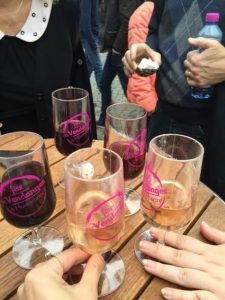 We came back red wine lovers after last year’s impromptu visit to Montmartre’s annual wine harvest festival, Fête des Vendanges, so continuing the celebration with friends at home is encouraged. Dining in Paris gave us a new appreciation several regional varieties, including fruity Beaujoulais from the namesake region just north of Lyon, and more full bodied Pinot Noirs from Burgundy. Gifting French wine will no doubt make you a friend worth of celebration. 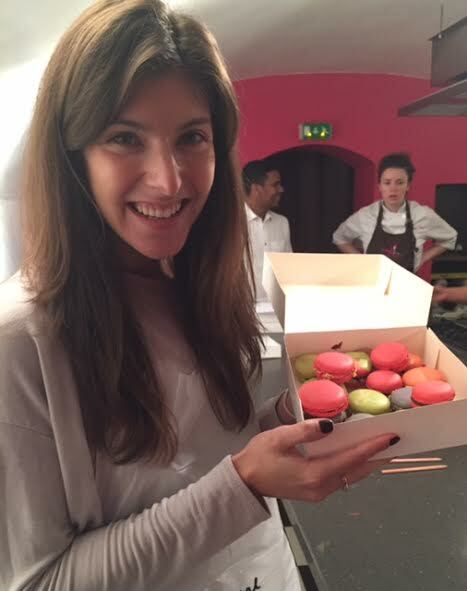 Every day of our Sweet Trip to Paris we spend some time in a local kitchen creating some of the city’s most iconic baked goods. Macarons, éclairs and cinnamon knots you’ve made with us won’t necessarily last until you fly back, but making them again for friends once back in your home country is sure to be the best souvenir ever. Check out the details for our upcoming Foodie Trips to Paris and see you in the City of Lights in 2017! To view itinerary details for our Sweet Trip to Paris and Tuscan Culinary Adventure, click here or contact our designated travel agent Clara Power at 416.996.6849 or cpower@tpi.ca to book. Tagged Angelina, beaujoulais, biscuits, brittle, brunch, caramels, chestnut puree, cinnamon knots, city of lights, confectionary, creme de marron, croissants, elcairs, Fete des Vendages, Foodie Trips, Jacques Genin, La Cure Gourmande, Le Marais, macarons, madaleines, maison george larnicol, Mariage Freres, Meilleur Ouvrier de France, patisserie, pinot noir, Saint Germain, souvenirs, Sweet Trip to Paris, tea, truffles. Bookmark the permalink. Get to Know Mangiacane's Antonella Bua!